“The Voice’ coaches CeeLo Green, Christina Aguilera, Blake Shelton and Adam Levine have come close to the end of the road for Season 5 of Blind Auditions with only a few spots left per team. Christina is back and on top of her game. She said, “Discovering talent is an exciting thing to be a port of,” and “It would be amazing for a female to finally knock out these boys.” Blake, of course, wants a fourth win of his own and admitted, ” I have one job and that’s to win.” The coaches all only have a few spots left to fill-up their teams. First up to audition was Matt Cermanski. Matt is a young 20-year-old who is back on ‘The Voice’ for a second time. He first auditioned singing Katy Perry’s “Teenage Dream.” Matt said it wasn’t his best performance. Since his first Blind Audition, Matt has been working on finding himself as an artist by playing more gigs and taking vocal lessons. No chairs turned around. Blake said “Gosh dang he was good.” Adam said he has to be “stupid picky” because he only has one slot left. Blake said “I don’t know what the hell I would have done with you.” Christina said, “We’re just being really choosey at this point.” All of the coaches thought that CeeLo should have pushed his button. CeeLo said Diego is just not what he’s looking for right now, but liked his song choice. Tamara is 23-years-old. She sang in church when she was a little girl and had her first public performance at age seven. After turning eighteen and not having her big break, Tamara became a leasing agent and temporarily gave up on her dream. Her foundation is gospel music but would like to have a broader audience which is why she is auditioning for ‘The Voice’. Christina pushed her button first, then CeeLo. Adam told her she has a beautiful voice. CeeLo commented, “It was gorgeous and so are you. Not too much of anything.” Christina said, “I loved it, you touched my heart.” Christina told her she started singing at age eleven too. Pointing-out a common-ground with Tamara, CeeLo told her his parents were also ministers and he became a sinner. Tamara joked “Come to Jesus.” CeeLo said “Jesus is pretty!’ In all seriousness, CeeLo told her “You seem like a really strong woman and I’d like to work with you.” Her gut told her to go with CeeLo. That left CeeLo with only two spots on his team. An exceptional 20-year-old Brandon Chase from Arlington, Texas, said he has sang a lot without payment because he’s an unknown artist. He was born very sick and his mother said she is thankful that he has his music. Brandon said he’s on The Voice because “The Voice is such a special opportunity. Not one that everybody get but one that everyone wants and hope to fulfill his destiny. Blake turned his chair for Brandon. CeeLo decided to jump-in and pushed his button too. CeeLo said “I can offer advice, dance, and flair. I don’t know about Blake.” Blake quickly took offense, but asked Brandon, “Do you want to be a country singer? Country music is something you can’t fake. It’s in your blood to be a country singer.” CeeLo tried to prevent Brandon from going to the country side and said, “I didn’t know it was a country song. It struck a chord with me.” Adam joked and told Brandon, “you should choose the coach based on who you’d rather be dressed like right now!” Brandon was wearing a plaid shirt like Blake. Brandon said he is going with his heart and chose Blake. Brandon said Blake was the one coach that he wanted to turn around the most. A flower deliveryman, Lupe Carroll said “Delivering flowers is kind of like ice cream coming down the street” he said because it makes people happy. He’s been performing at restaurants and Farmers Markets. Lupe said he married his best friend and would like to do everything he can to make her proud. He’s on The Voice because he’d like to stop playing late gigs and delivering flowers. CeeLo said for his last spot he’s looking for someone to take a chance. She said she grew-up singing country, but still chose to be on Team Adam. Adam said “Grey is awesome.” and the fact that she held up well under pressure, he thinks she’ll do incredibly well in the competition. Grey completed Team Adam. Dominic is 17-years-old. He said around eight years old, he knew he wanted to do music more than anything in his life. He did his first movie at four years old with Neal McDonough (Desperate Housewives star) who was at his Blind Audition to lend support. Dominic said he wants to do music. He’s dad is the drummer of The Commodores band which Lionel Richie was the vocalist. Dominic went to his first concert at 12 days old. He said there’s added pressure to doing a Commodores song for his Blind Audition. “I really wanted to do it myself” he said and not use his connections in trying to make it in the music industry. Singing “Balamis” by Enrique Igesis. Blake said, “Damit I can’t speak Spanish. I can’t dance the Salsa, but I can win this frekin show. Join team Blake.” Michael went with Christina. With the addition of Michael Lynch on her team, Team Christina was full! CeeLo said, “I’m being very critical. Your voice sounds so different than what you look like. That’s a contrast that would have been cool in my world.” Deanna smiled at that compliment. Blake saw a winner in her and said, “I think you’re not more than eight months away from wining this show,” and told her to come back next season. During a post interview, Blake said, “I have one spot left, I m looking for something that blows me away.” CeeLo is looking for his number one. Brian made his decision “I got to keep it country, I got to go with Blake”. With the addition of Brian, Blake’s team became full. Shelbie Z, E.G. Daily, Austin Jenckes, Holly Henry, Brandon Chase , Sam Cerniglia, Ray Boudreaux, Monika Leigh, Justin Chain, Emily Randolph, Chilla Chan, Brian Pounds. CeeLo is the only coach with one spot remaining. Shawn is a big 33-year-old guy from New York that towers over everyone. He’s a singing bartender. In 2009 he enlisted in the Army. He did a tour in Iraq where during an accident, he lost 80 percent of his hearing. The Battle Rounds are next..
Cher will be Team Blake’s adviser. Miguel will be Team CeeLo’s adviser. Ryan Tedder is advising Team Adam, Ed Sherran is advising Team Christina. 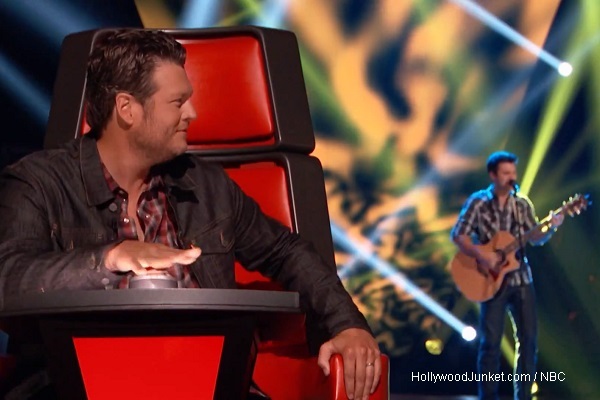 Watch THE VOICE Season 5 Episode 5 – The Blind Auditions Part 5, originally aired on Monday, October 7, 2013.